ALBUQUERQUE, N.M. (AP) — A blond-haired, blue-eyed man gazes forward from the decades-old, controversial mural, his arms stretched out holding the hand of a faceless Hispanic man on one side and a faceless Native American on the other. 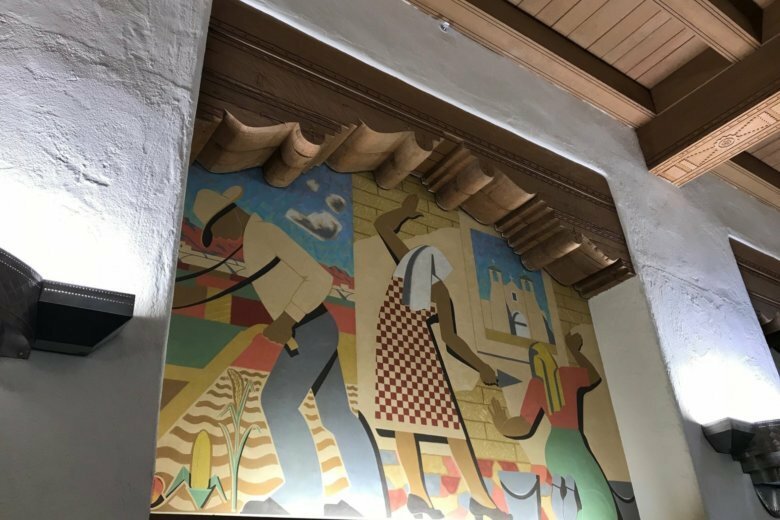 For decades, the Great Depression-era mural on the University of New Mexico campus in Albuquerque and the white man’s place at the center of it have irked numerous faculty members and students, who say the scene it depicts marginalizes the state’s two largest minority groups. Painted in 1939, it is one of four “Three Peoples” murals commissioned under the federal Public Works of Art Project for the school’s Zimmerman Library. Now, the university’s president and provost are recommending that curtains cover all four murals as a campus dialogue continues on them, said Alex Lubin, who is the school’s associate provost for faculty development. The proposal from President Garnett Stokes and Provost Richard Wood must next go before the Regents Historic Preservation Committee. The students also had pushed for several years for the school to recognize Indigenous Peoples’ Day instead of Columbus Day, which happened on campus for the first time Monday, Minthorn said. On campus, the views on the murals among students outside of the organized groups and efforts to change the murals can be mixed. Student Zachary Martinez told KRQE-TV last week that he saw beauty in the artwork. “I think it helps represent New Mexico well,” he said.